As you drive down Pemberton meadows, the setting sun silhouettes two peaks on the far horizon: aptly named Pylon, and Meager (previously aptly named Cathedral). I desperately wanted to ski these but thought I had missed my window, until old ‘father winter’ sand bagged us with a late season dump followed by clear skies. Li’l bro Dave and I sledded into base camp late at night and met Dave B. and John Johnson. 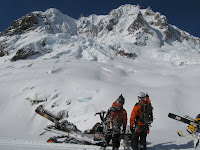 We spent the following morning punching a new sled route up onto the glaciers that connect the amazing volcanic peaks. Jack Hannah and Cheddar followed our tracks and caught us climbing the last pitch to Cathedral’s peak. As we skied the first N.E. face, Dave B. was the last to drop in while I was watching from behind a rock below; camera in hand. On his second knuckle dragging turn, he hit an unstable pocket that released and fired down slope at me like a freight train. In the split second I had to react, I thought of getting the shot, instead, I took a mental picture as I ducked behind my ‘safe rock’ and dodged the slide that caused another avalanche further down and disappeared into the crevasses below. Instead of following the slide path, we cut over the ridge to the North face where the snow was amazing. 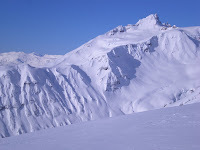 We carefully shredded down onto the spine crux, and into the open bowl to the sleds below. We should have called it quits there; but Pylon looked so good, and we justified the avalanche by Cathedral’s sun exposure. 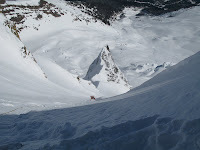 By rights of setting the boot pack up Pylon's North chute, I dropped in first and had a good run down the steep face. The run was similar to that of Cathedral's but on a much smaller scale; beginning with a protected N.E. fan that chocked on a spine, then opened again into the bowl. John was next and similar to Dave B’s turn on Cathedral, he released a slab that threatened to pull him off the face over cliffs. By punching his fists through the slab into the snow below he was able to stop. They then skied down the chute that we hiked up, but Dave B hit another pocket and released a small slab that poured off the cliff below and onto Little Dave and Cheddar. They were able to run down slope and avoid taking it on the head, then Dave played 'Marco/Pollo with his radio until he found it under a foot of debris. 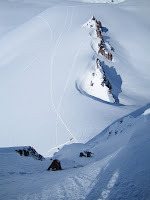 I still had to ski down another shorter pitch, so I waited until the crew made it around by sled, then ski cut the convex roll, which predictably released the entire slope I was about to ski. I scratched my way down, and we headed back to camp. Day 2, we packed away our skis, and sledded deep into the Coast Range, scoping other epic faces that will haunt our dreams until we get back there again. Keeping with our theme of being too ambitious we attempted a new route off the glacier, only to be cut off by a canyon. We retreated and made a first sled decent down another drainage that we had previously scoped. We were all pretty stoked to arrive at the valley bottom, assuming our trials were over. After a crossing a couple sketchy avi debri paths, and siphoning gas from one sled to another, then towing as we continued to run out of fuel, we arrived at the trucks. Safe, tired, happy, and a little smarter.